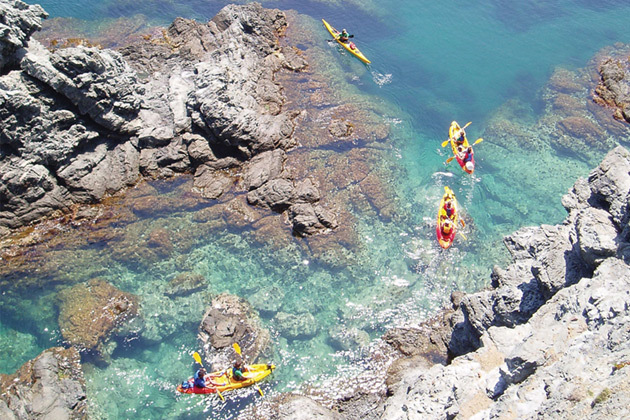 Catalonia has so much to offer and lots of exciting new activities to try: go sea kayaking along the coast, swim through turquoise rivers and abseil down waterfalls and rock faces. The Catalan coast has an abundance of caves, cliffs and coves perfect to explore by kayak – enjoy the warm turquoise waters and visit monasteries and castles on foot to discover the history of this picturesque part of the country. After you’ve dried off, test your skills with a bow and arrow, take to the tree-tops and experience the thrill of zip-lining – kids will love zooming through the forest Tarzan-style. Travelling in Catalonia is ideal for families as time spent in a moving vehicle is kept to a minimum, leaving more time to discover the area and ensuring that every day is fun-filled and action-packed. In winter the Spanish Pyrenees transform into the perfect setting for every child’s snowy action-packed adventure. Instead of just skiing, they’ll get to try a handful of winter sports, all fantastically varied and exciting. Have fun on the slopes skiing or snowboarding, and go on cross-country skiing and snow-shoeing adventures through forests and meadows in the foothills of the Pyrenees. If that hasn’t tired your kids out yet then they can go sledging and learn how to build an igloo! As well as activities in the snow, you can also explore the impressive medieval town of Jaca, known as the ‘pearl of the Pyrenees’ with beautiful pedestrian streets and visit its cathedral, monastery and citadel. Escape the crowds of the big cities and touristy beaches and rediscover the best of authentic Spain on one of our fantastic adventure activity holidays. Sample local cuisine, try out a new activity like snow shoeing or archery and after an action-packed, adrenaline-fueled day, relax and recharge in comfortable accommodation in stunning settings. It’s these sort of unforgettable adventures that will stay with children and adults alike for a long time.